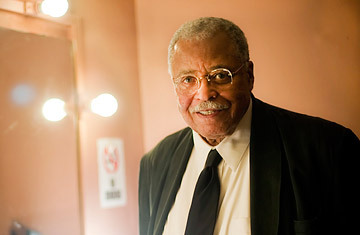 Actor James Earl Jones poses for a photograph backstage at the Golden Theater in New York. Sometimes it's easy to forget that James Earl Jones is an actual person with a head and arms and legs rather than the disembodied voice he so often seems to be. Jones, who turned 80 on Jan. 17, has acted for over five decades in theater, television and film. But it's his voice  low, resonating, authoritative  that lingers in the minds of audiences. That steady bass behind such memorable lines as "Luke, I am your father" and "This is CNN" is easily among the most iconic in history. Jones was born in 1931 in Mississippi to recently separated parents and was raised by his maternal grandparents. When he was 5, the family moved to Michigan, and he developed a debilitating stutter most likely caused by the trauma of his early childhood. For almost a decade, he spoke very little with his family and not at all in school. From age 10 to 14, he was effectively mute. A resourceful English teacher made Jones finally break his silence by forcing him to read aloud in front of the class a poem he'd written. The teenager was shocked to find that, in reciting the words he already knew so well, he was able to speak clearly and without any sign of a stammer. "I had stumbled on a principle which speech therapists and psychologists understand," he explained in his 1994 memoir Voices and Silences. "The written word is safe for the stutterer. The script is a sanctuary." During its period of hibernation, Jones' voice had changed; it re-emerged as something much closer to the confident bass we now know. Having lost and found his voice before the age of 20, Jones became a champion public speaker at his high school and developed a strong interest in performing. It would take a series of acting and voice lessons before Jones the debate-team star became Jones the renowned voice actor (he claims to still struggle with his speech impediment today). But his early years saw him flourish both in front of the camera and on the stage. He played the title character in a 1955 theater production of Othello, notched his first movie role in Stanley Kubrick's 1964 film Dr. Strangelove and appeared in the 1977 hit TV miniseries Roots. In 1969 he won a Tony for Best Actor for his performance as Jack Jefferson in Great White Hope, a feat he repeated in 1987 for the lead in August Wilson's Fences. The former was made into a movie in 1970, for which he was nominated for a Best Actor Oscar. But it was his work behind the microphone that would truly resonate with audiences. With Disney's The Lion King, a new generation of kids gained a much kinder association with his voice than their parents had. This time, Jones was not an evil dad but Mufasa, the king of the Pride Lands and a doting father full of life lessons. Since then, Jones' voice has become ingrained not only in the U.S.'s collective cinematic memory but also in America's daily home lives. He is essentially the voice of CNN (which is owned by the same corporate parent as TIME), having first recorded the line "This is CNN" in 1990 to celebrate the network's 10th anniversary. The sound clip has been the cable news channel's calling card ever since.